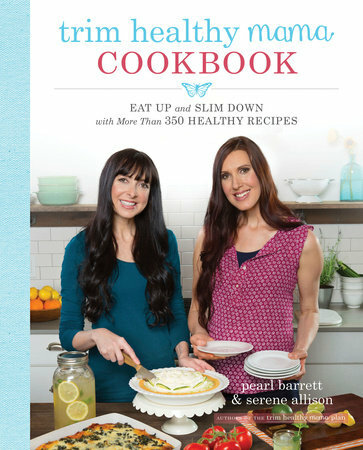 The Trim Healthy Mama Cookbook by Pearl Barrett and Serene Allison is a companion book to the original Trim Healthy Mama plan. I've been seeing Trim Healthy Mama all over the internet; blogs, Twitter, Pinterest, everywhere! At first I thought, "oh no, not another diet plan!" So I didn't hop on the band wagon. Then I started looking at some of the reviews and noticed that many people were singing its praises. I decided to give the cookbook a try, but not the diet though. I was pleasantly surprised. This cookbook is now well used, well worn and is often a go-to cookbook for our family. The recipes are right up our alley and healthy too! Now, I will add, that the diet consists of not using white sugar or white flour, which I totally understand that the two are devoid of all nutritional value but I still wasn't going to purchase their sugar and flour blends for their recipes. I just used what I had on hand and even though I might not get the figure that many women who use their diet are going for, I am fine with that! The sisters who wrote this cookbook are not newbies when it comes to being in the spotlight. Their mother is famous for the Above Rubies Magazine and women retreats for those of the quiverfull mentality. I actually receive the magazine and have much respect for their mother. I love that both women showcase their large families in the cookbook with one even carrying a newborn. It's a sweet and gentle reminder of the true importance of cooking good meals for your family. Pearl and Serene were also members of the 90's Christian band, Considering Lily, so again, this is not the first time they have been in the public eye. One of my favorite aspects of the cookbook is that venison is mentioned as a beef substitute. I never see that ingredient in normal cookbooks and even though I will substitute for beef often with venisom, I appreciated seeing it in the cookbook! We have tried and loved many recipes in this book. A new staple in our home is now their cheeseburger pie, my family loves it and requests it often! I highly recommend this book if you are cooking for a large family and want to start down a healthy route, there are plenty of amazing recipes that your whole family will enjoy! Disclaimer: This book is brought to you by Blogging For Books. All opinions stated here are my own.